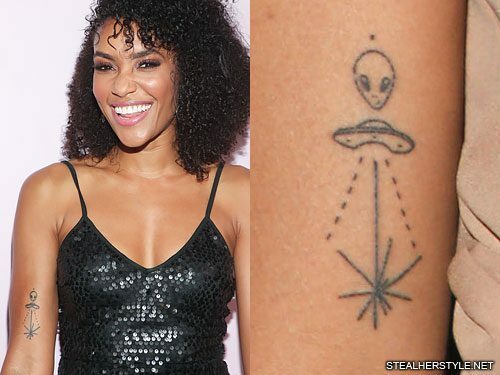 Annie Ilonzeh has an alien spaceship with a beam shooting down inked on her arm. 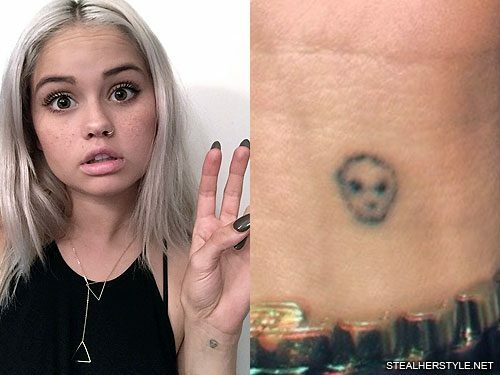 Debby Ryan had this little stick-and-poke alien tattoo for about two years. 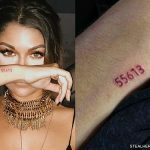 She first showed off the alien on the inside of her left wrist in January 2015 and then in January 2017 she covered it up with a new design. 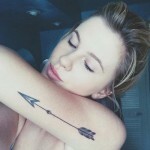 In response to a question about her tattoo on tumblr, she quoted “If I find in myself a desire which nothing in this world can satisfy, the only explanation must be that I was made for another world.” by author CS Lewis. 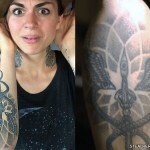 She was very much into “out of this world” extraterrestrial vibes at the time that she got the tattoo — but so was her ex-boyfriend. She has been in an on-again, off-again relationship with Twenty One Pilots drummer Josh Dun, who sometimes wears an alien mask on stage. The tattoo is not specifically about him and it seems like they were actually broken up when she got it. But the connection to Josh might explain why she wanted to get rid of the faded inking rather than redo it. 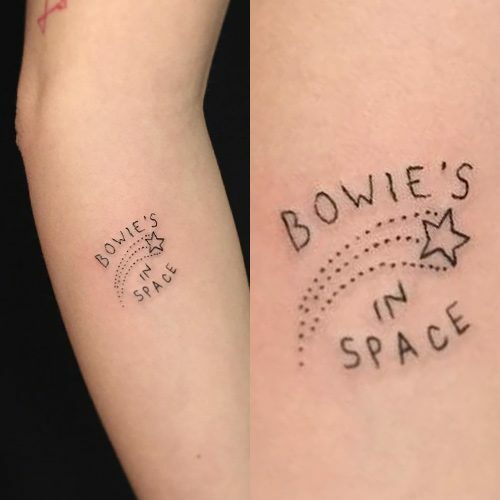 Camille Rowe has a tattoo on her forearm reading “Bowie’s in space”. Vanessa Martinez has a space inspired tattoo on her left forearm. 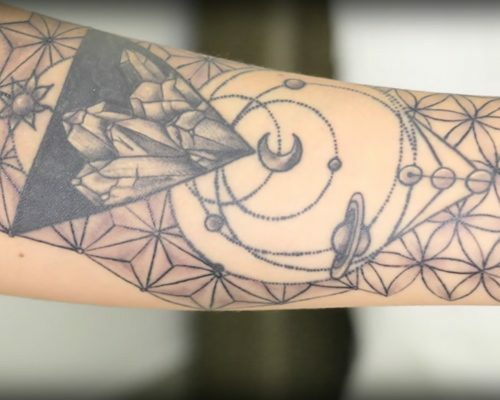 This ink was the forth she did and it interconnects with a triangle form filled with crystals done at the same time. The triangle represents femininity while the space reminds her of the fascination she has for space and her younger idea of becoming an astronaut. There she has the Sun and the Moon and her favorite planet – Saturn – also three small circles at the bottom, because “3” is an important number in the Universe. 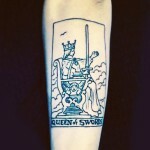 Frances Bean Cobain has an abstract space circles tattoo on her forearm by Dr. Woo. 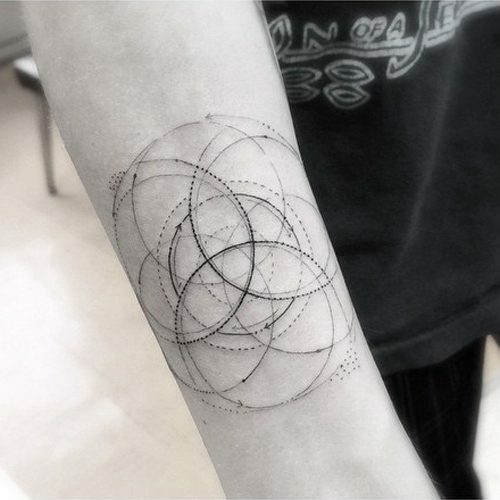 In April 2016, Ellie Goulding got this geometric design tattooed on her left side by Dr Woo, the same artist who did a similar piece on the opposite side of her ribcage. Dr Woo created this original piece of art based on inspiration photos that Ellie brought in to his studio. It is inspired by stars, planets and galaxies, but he took lots of artistic license to create a geometric piece that isn’t too literal. 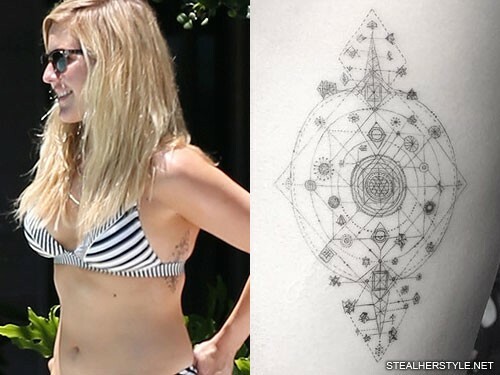 Kesha got this tattoo of an alien spaceship on her left forearm in February 2016. The simple drawing includes dotted lines to indicate that it is about to abduct someone. “Meet me in space,” she wrote on instagram. 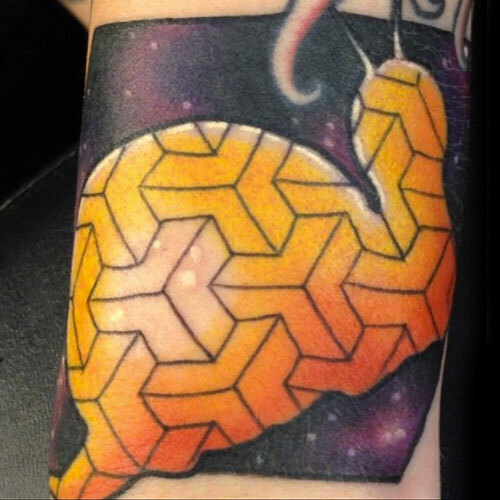 Her artist Sean From Texas frequently features aliens and spaceships in his tattoos. Samantha Maria has a small planet tattoo on her ring finger. 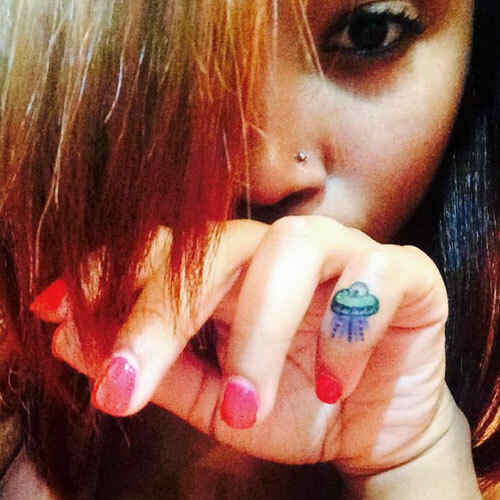 Zonnique Pullins has a green and purple spaceship tattooed on her pinkie finger knuckle. “In my own little world. Always,” she tweeted.